Abstract : Current edge-preserving image decompositions assume image detail to be low contrast variation. Consequently they apply filters that extract features with increasing contrast as successive layers of detail. As a result, they are unable to distinguish between high-contrast, fine-scale features and edges of similar contrast that are to be preserved. We propose a new model for detail that inherently captures oscillations, a key property that distinguishes textures from individual edges. Inspired by techniques in empirical data analysis and morphological image analysis, we use the local extrema of the input image to provide information about oscillations: We define detail as oscillations between local minima and maxima. 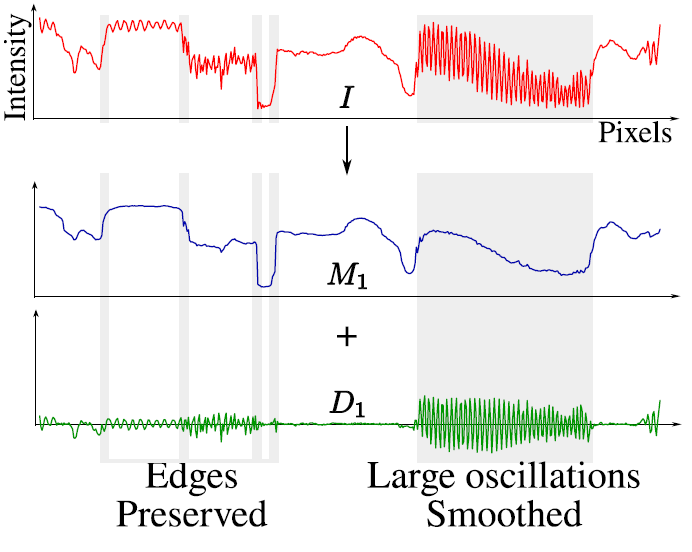 Building on the key observation that the spatial scale of oscillations are characterized by the density of local extrema, we develop a simple algorithm for decomposing images into multiple scales of superposed oscillations. We compare our results with existing edge-preserving image decomposition algorithms and demonstrate exciting applications that are made possible by our new notion of detail.